Guy Ryder is a fully qualified Poole osteopath, working in Broadstone and Wimborne areas. He is able to treat and help with a variety of aches and pains. If you are suffering from lower back pain in Poole, neck pain in Broadstone, or are looking for osteopaths in Wimborne, Guy Ryder can help. He offers an initial free 15 minute osteopathic consultation to all new patients. Cranial osteopathy is a specialist service offered by Guy Ryder, providing an effective yet gentle approach to treatment for a wide range of problems. Using a highly developed sense of touch, cranial osteopathy finds subtle areas of tension to diagnose problem areas throughout your anatomy. 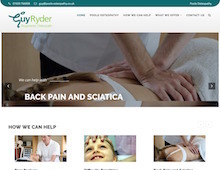 Contact Guy Ryder, your local Osteopath in Broadstone, Poole for relief from back pain, neck pain, frozen shoulder, sciatica, headaches, sports injuries and more.